Looking for cool DIY projects for men that aren't the usual suspects on a honey-do list? These will improve both your home AND your family's lifestyle. I hate working on projects inside the house. My wife will back me up on this. I’m great at starting them but finishing is a different story. Four years ago, we took a section of wall down in the living room…she’ still waiting for me to repaint that wall. She says I follow the 80/20 rule when it comes to projects inside the home: I complete a firm 80% of the inside project and then move on to the next before getting to that last 20%. Outdoor projects are what get the neighbors to stop and talk for a while. They take your home from the before pictures to the after magazine spread. They are also something the whole family can work on together. Forget the frustration of trying to keep the kids out of the paint, or attempting to remodel a kitchen over a weekend. With nicer weather and plans to spend time outdoors on the horizon, here are some ideas on outdoor DIY projects for men you’ll not only want to start but also want to finish as well. Now if you excuse me, I still have a wall to paint…. Good porches might make good neighbors but porch swings make for lifelong friendships. Whether it’s sharing coffee in the morning or sipping your libation of choice while watching the kids play, porch swings just invite friends and family alike to sit and stay awhile. You might even get a pass on those unfinished inside projects if you toss in comfy throw pillows and a blanket for her while she dives into a good book. Get the plans from April Wilkerson here. Is there a guy on Earth that doesn’t love fire? From grilling and smoking to fireplaces and firepits – guys are wired to be lifelong pyromaniacs. Chris at ManMadeDIY has created these very cool concrete fire bowls that not only look great but they’ll help you burn things to your heart’s content. These fire bowls would also be awesome lining a driveway or pool! If you’re short on time or if working with concrete is not your thing, you can also find concrete fire bowls online like this one in the same 18′ diameter as the one in this project. One of the first things people notice about your home is the mailbox. The last thing it should be is generic. Sure you could have a standard issue black mailbox – but shouldn’t it at least add some style and curb appeal? This mailbox makeover lets you do just that. You probably don’t have the space to put up a tennis or beach volleyball court in your yard. But, that doesn’t mean you can’t have any fun at all though. A DIY horseshoe pit is a perfect for parties or just hanging out with the family. These are relatively fast and easy to make so you may want to drag it out some so you don’t have to tackle one of those never-ending, unfinished indoor projects (by the way, I will deny saying this if exposed). Lawn maintenance might just be the bane of my existence. It’s one of those tasks that as soon as you finish, it’s time to start again. Edging can especially be a nightmare as you try to keep the grass out of the flower beds while also trying to keep the weed whacker from destroying the flowers themselves. Now you can install a maintenance free solution that will keep everyone safe and in their place. Choose bricks that match your home for an extra boost of curb appeal. Front yard or back, pergolas are a guaranteed way to improve the livability of your home. Rather than draping ours with fabric like this one, we used climbing grape vines to create our roof and drapes down the sides. While this project looks complicated, it really isn’t and can easily be completed in a weekend if you keep the 80/20 rule at bay. If your front porch is anything like mine, “attractive” would not be one of the first words that comes to mind. Ditch the discolored concrete, lose the minefield of kids’ shoes and discarded toys, and create an entrance that is actually welcoming. Putting down slate tile like Decor and The Dog used in this project is an economical and eye-appealing choice for a front porch revamp. It will stand up to the elements while also perking up the look of your home as well. Every once in a while we need a project that is really just for ourselves. Yes, selfish I know. Now that we’ve gotten that off our chest, check out these plans from Fox Hollow Cottage on how to build a wooden deck cooler. Maybe you have carved out a bit of the yard as your domain…..or maybe now you will since we just planted that seed. Either way – this cooler should have a place in it. Rather buy than DIY on this project? Amazon has a few wooden coolers worth checking out. Shutters are such a great way to add curb appeal to your home with minimal effort. They are also a great way to go broke if you have a large number of windows in your home like we do! Luckily Cozy.Cottage.Cute. made their own board and batten shutters and shared the details with all of us so you won’t wear out your wallet. Outdoor kitchens are one of those things you can’t help but drool over. I hate having to go back and forth between the house and the yard when holding parties. I’d rather have everything I need outside with me so I can just hang out while cooking and entertaining. 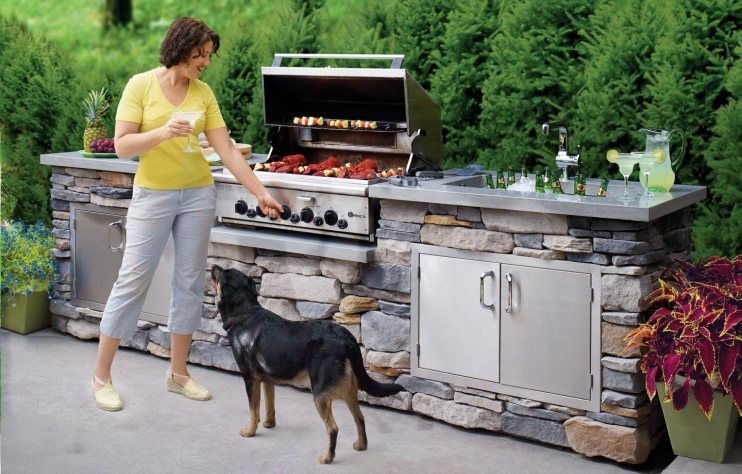 These plans for an outdoor kitchen from This Old House are the perfect solution to that problem. If your budget doesn’t allow for something quite as intricate there are plenty of other options out there as well. Your outdoor kitchen can’t be complete without a few tables and chairs for entertaining. Actually, these chairs would also look great on that slate tiled front porch you now need to install. Adirondack chairs are classic and no home should be without a couple. Make a few of your own then sit down, relax, and enjoy the amazing outdoor space you’ve created so far! What can be an automatic improvement to any outdoor space? Some greenery. We built a few of these pallet planters with plans from Home Talk. One planter sits on our front porch to add some color to the house. The other one is by our outdoor kitchen with herbs and a few veggies growing in it, so we have access to fresh produce without ever leaving our yard. We should have done that years ago! Friendly neighbors are great but sometimes you want some privacy from them. However, whether it’s HOA rules or zero lot lines, sometimes putting up a fence isn’t always an option. Four Generations, One Roof has a great alternative to a fence that will give you the privacy without the expense or labor of actually installing one. A lattice privacy screen also provides a great space to add lighting for your outdoor area. It’s hard to enjoy the outdoors if the sun is constantly beaming down on you. Not all of us have shade trees in the yard so what do you do instead? Get out there and create your own outdoor canopies. This affordable option from Lifehacker allows you to put up canopies in multiple areas: cover the kids sandbox, place another over the patio, and heck, maybe even give the dog his own cabana too. Bonus points to those who use fabric that coordinates with your home or outdoor furniture. The best sleep you’ll ever get is in the fresh air. Whether it’s a power nap during the day or sleeping hard at night, there’s is nothing that can compare to that kind of sleep. Wouldn’t it be cool to have a place to catch a power nap outdoors? Pretty Prudent has some good plans for an outdoor daybed. The plans not only call for repurposing pallets, they also include casters so you can move it around as needed. Outdoor movie showings are pretty popular around me. I love the idea but hate the logistics behind them. Lugging chairs, blankets, snacks, and drinks back and forth from the car to the field is not my idea of fun. It would be great if you could enjoy a movie outside without leaving the convenience of home. Shabby Creek Cottage shows you how to build your own outdoor movie screen so you can roll out your recently built pallet daybed, enjoy the show, and avoid the Port-a-potties to boot. figure out what that something is – a window box planter might be just what you need. Two Twenty One has an easy tutorial on how to build one. Container gardening is great because it keeps your soil from getting washed out when it rains, which is always a pain. Even if you don’t need the window boxes – build them anyway. After all, it keeps you from having to go inside and paint that living room wall. 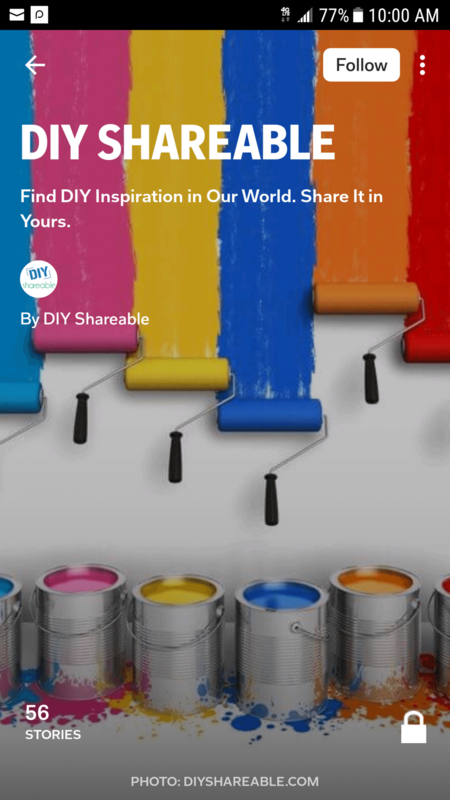 Now that I’ve given you 17 ways to avoid your honey-do list without ending up in the doghouse, it’s time to get outside and start one or more of these cool DIY projects for men. Remember that the best DIY projects are those that make life easier and more enjoyable for you and your family. Curb appeal should also have family appeal. Front yard or back yard, porch or pool – invest in the areas you use the most so your hard work gets appreciated day in and day out. Let us know what your favorite projects on this list were or if you have any tips that might make the projects easier. Do you have a great way to boost curb appeal or an awesome hack for the backyard? Make sure to send us pictures of your work and don’t forget to share these ideas with any guys looking for a project!